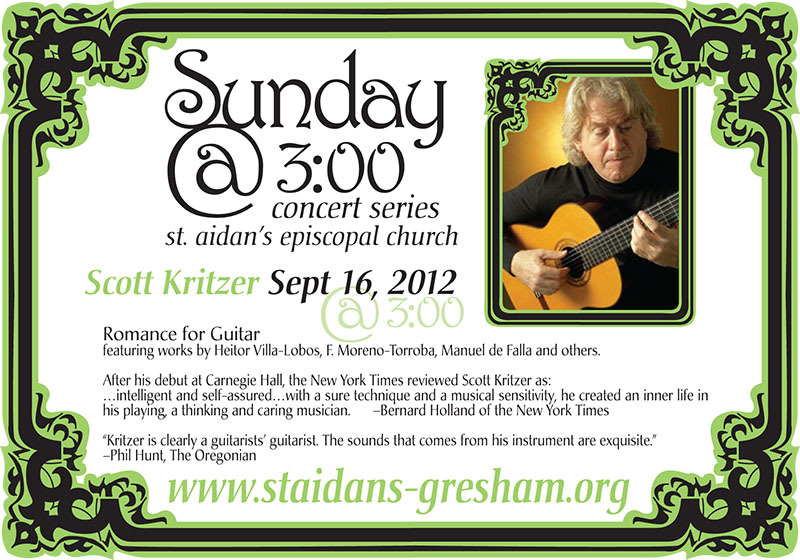 Scott Kritzer will perform his only solo performance of the year in the Portland area when he appears the innagural performance on St. Aidan’s @ 3:00 Series. St. Aidan’s Episcopal Church is located at 17405 NE Glisan Street in Gresham, Oregon. Tickets for the concert are $18 general admission, and $15 for students (with school ID) and seniors (60 or older). For ticket information go to St Aidan’s Episcopal Church. Click for DIRECTIONS. For ticket information go to and scroll down to ‘Upcoming Events’. 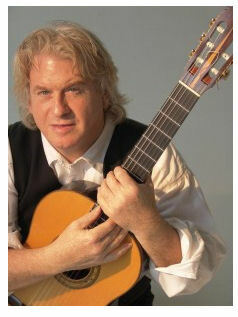 The program will feature works by Manuel de Falla, Heitor Villa-Lobos, Francisco Tarrega, and others featured on his popular recording Romance for Guitar. To hear excerpts from the program, please go to LISTEN. 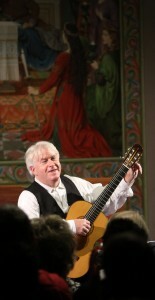 This entry was posted in Concerts and Events and tagged classical guitar, classical guitar concert, classical guitar technique, concert, Fernando Sor, guitar concert, Manuel de Falla, scott kritzer. Bookmark the permalink. 2 seniors want to go to your concert tomorrow, but I can’t figure out how to get tickets. I went to “Upcoming Events” and that didn’t get me anywhere that I could see to purchase tickets. Can we get them at the door??? Forget my prior message, I figured it out. See you tomorrow.